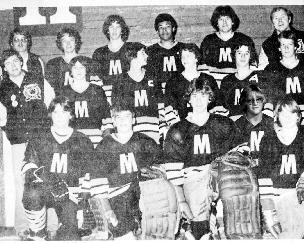 These young men displayed their hockey prowess by capturing Middleton’s second Provincial hockey title in history in 1983-84 and then repeating this difficult feat the following season in 1984-85. Of these twenty-six Mustang Bantams, eleven were on both Championship teams, eight on the first year only and seven only on the second year. Both years the Mustangs were also Victorious as Valley Zone and Western Nova Scotia Zone Champions. In 1983-84 the Clare Durland led Mustangs, assisted by Bill Sampson along with David Boates and Dr. Ian Robb, journeyed up the Valley to Hants County Exhibition Arena. 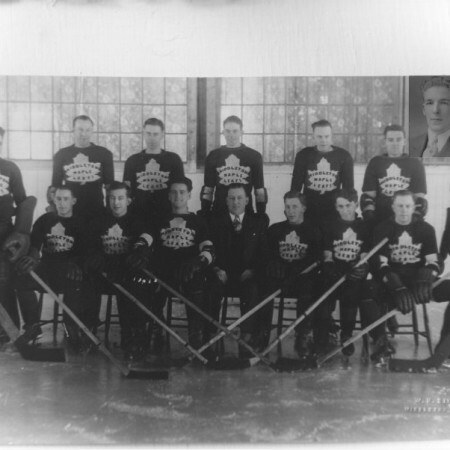 In the three game round-robin they soundly defeated host Windsor Maple Leafs 5-1, the North Shore (Tatamagouche) 6-2 and Port Hawkesbury in Cape Breton 6-1. Individual awards garnered included: Greg Wagner-Tournament Most Valuable Player, Sean Pickrem- Leading Points, David Robb-All star Goalie, and Norman Goucher-All star Defence. In 1984-85 with the absence of head coach S. Albert Johnson, Hugh MacLeod along with Cecil Robicheau and David Boates took up the reins as the Mustangs headed cross country to the Bridgewater Memorial Arena. In the three game round-robins they outhustled the opposition to down Cole Harbour from Metro 7-3, Canso from Eastern N.S. 7-2 and host Bridgewater Hawks, 5-0. Individual award winners included: Leigh Boates-Tournament M.V.P. and Leading Points, Kevin Stoddart-Tournament Top Defenceman, and Scott Gates- All Star Forward. Most of these young men went on to contribute significantly to the Middleton Regional High School Blues hockey team over the next few years along with contributing in many other sports. 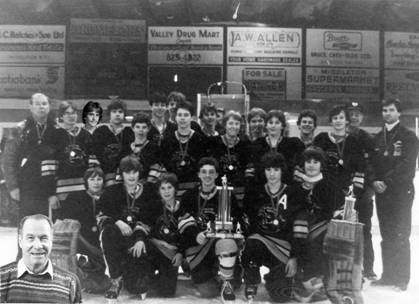 Their exploits over their two year reign as Nova Scotia Bantam “D” hockey champions added much to the hockey lore of the Middleton and District area.